Fractal. (2008). In D. Nelson (Ed. ), The Penguin dictionary of mathematics. (4th ed.). [Online]. London: Penguin. Available from: https://search.credoreference.com/content/topic/fractals [Accessed 26 April 2019]. "fractal." The Penguin Dictionary of Mathematics, edited by David Nelson, Penguin, 4th edition, 2008. Credo Reference, https://search.credoreference.com/content/topic/fractals. Accessed 26 Apr. 2019. Geometrical figure in which an identical motif is repeated on a reducing scale; the figure is 'self-similar'. Coined by Benoit Mandelbrot, fractal geometry is closely associated with chaos theory. Fractal objects in nature include shells, cauliflowers, mountains and clouds. Fractals are also produced mathematically in computer graphics. A term introduced in 1975 by the French mathematician B.B. 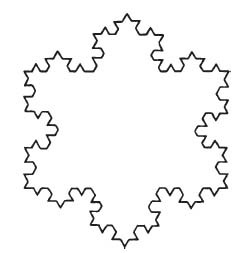 Mandelbrot to describe geometric objects that, in a certain sense, have ‘fractional dimension’. It includes sets such as the snowflake curve and Cantor set generated by some infinitely repeated process and possessing selfsimilarity, i.e. every point of the set is contained in a scaled-down copy of the entire set. In general, a fractal is a set of points with a similarity dimension or Hausdorff dimension which is not an integer (see below). In many cases, the attractor or strange attractor (see chaos) associated with a transformation or flow is a fractal. A self-similar fractal S in a space of dimension d can be given a similarity dimension D, where 0 ≤ D ≤ d. If there are N similarities with scale factors r1, r2, …, rN that map S into itself, then D satisfies the equation (r1)D + … + (rN)D = 1. For example, the Cantor set C has self-similarities x → 1/3x and x → 2/3 + 1/3x. In this case, r1 = r2 = 1/3, and so D = ln2/ln3. The interval [0, 1], the snowflake curve, and the unit square have similarity dimension 1, ln4/ln3, and 2, respectively. The Hausdorff dimension is a more general definition introduced by F. Hausdorff in 1919. It can be defined for any set in n- dimensional Euclidean space. For sets with self-similarities, the Hausdorff dimension and similarity dimension coincide. Fractal curves are used in producing designs in computer graphics. Many of the designs have a natural form (e.g. the snowflake curve - see diagram). Fractal geometry has been used to study crystal formation, electrical discharges, coagulation of particles, urban growth, and many other areas. fractal An early stage in the generation of the snowflake curve. Topic Pages contain an overview, definitions, biographies, related topics, images, plus links to relevant articles and other content provided by your library. Topic Mandelbrot, Benoit B.